OK, it took a bit longer than I expected to get back into blogging after the move. Settled into new house OK, though still have a few boxes to sort and unpack, mostly books. There's a fair bit of work to do, but mostly superficial and I think we'll work on them gradually. But that's enough about my life, you're presumably here for weirdness and meetings ...in spaaaace! The Enterprise is in trouble, spining out of control, Bridge and Engineering try desperately to save it. Just as Picard orders everyone to abandon ship, it explodes! The Enterprise is going into a previously unexplored part of space. 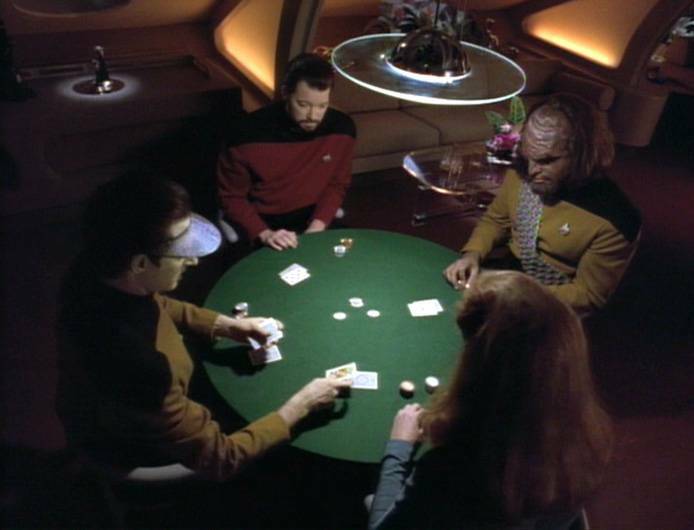 Data, Riker, Worf and Dr Crusher play cards; Riker bluffs, but Beverly beats him. Then she's called to sickbay to see Geordi; he seems to have an inner ear infection, except without the infection. She has a super strong sense of deja vu. As she's going to bed she hears voices, it startles her and she knocks a glass over. Beverly reports her experience during a routine staff meeting. Worf calls from the Bridge to report weird readings. There's a weird field ahead and the engines aren't working. A Federation-looking ship emerges and is going to collide with the Enterprise, they don't respond to hails. Riker suggests a plan for getting out of the way, but Data suggests something else and Picard goes with Data's plan. The other ship hits the Enterprise. It's in trouble, spinning out of control, Bridge and Engineering try desperately to save it. 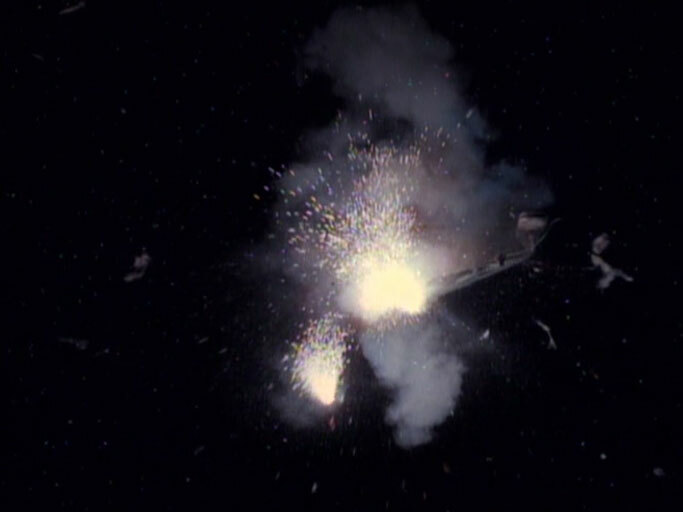 Just as Picard orders everyone to abandon ship, it explodes! The Enterprise is going into a previously unexplored part of space. The same card game is happening, but Beverly is distracted. Riker knows she is going to call his bluff, and they both have a feeling about which cards are next. Beverly is called to sickbay to see Geordi. 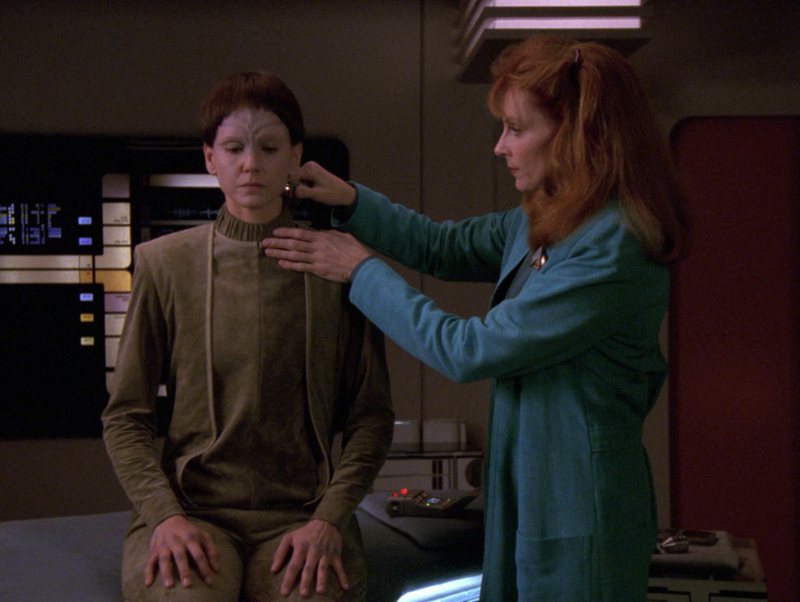 She pauses during her diagnosis because its so familiar, and Geordi feels like its familiar this time too. 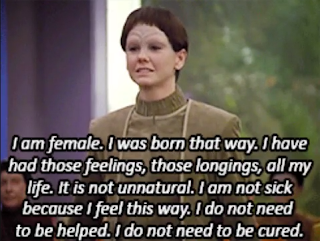 They check the logs but can't find that Geordi's had these symptoms before. Can 2 people have deja vu about the same thing? As she's going to bed Beverly is still distracted, things are eerily familiar. She puts down her glass cautiously, but still knocks it over when she hears voices. This time she goes to see Picard straight away. They have a cosy chat, Picard was reading a book and he was sure he'd read it before, but couldn't think when. He says it might be nothing, but will get Geordi and Data to scan and report in the morning; they find nothing. Worf calls from the Bridge to report weird readings. Weird field ahead. Engines aren't working. Federation-looking ship on collision course. Riker and Data suggest plans, Picard goes with Data's. Collision, ship spinning out of control. Just as Picard orders everyone to abandon ship, it explodes! The Enterprise is going into a previously unexplored part of space. The same card game is happening, but Worf has deja vu, as does Beverly who can now name the cards before Data deals them. Everyone's a bit freaked out. Worf and Riker can also name the cards. Crusher checks if Geordi is in sick bay, just before he arrives. Beverly calls Picard (more official, less cosy this time). She reports her experience and says others have the same feeling. She knew standard tests wouldn't work on Geordi, so she did something that showed his visor was picking up images that weren't there. Again she has touble preparing for bed and is uneasy, unwilling to finish any action because of the familiarity. She moves her glass away from her bedside table. When the voices come she records them. Then she calls Geordi immediately and asks if sensors picked up anything weird. She goes to Engineering, knocking the glass over on her way out. Geordi and Data analyse her recording. There are about 1000 voices overlapping and Data identifies them as the voices of the Enterprise crew. Crusher calls early staff meeting, Geordi explains that they're probably stuck in a time loop. Data plays the recording and isolates the part where Worf finds the weird readings and the collision happens. They can try to avoid the collision but Geordi points out it could still happen again, so they should try to send a message to themsleves in the next loop, Data will probably get it but not consciously. Geordi works on Data to set up the message emitter, and they muse on what they might have tried before. Beverley points out that it doesn't feel familiar anymore, which is hopefully a good sign. Red alert goes on as they encounter the field again. Engines aren't working. 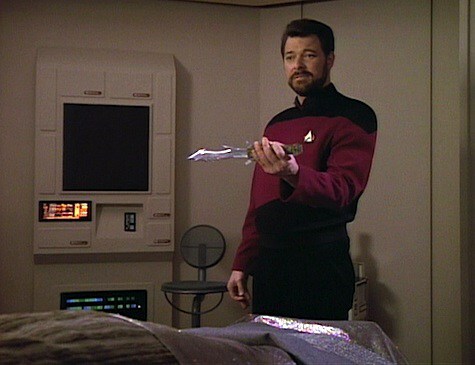 Riker wonders how they dealt with this before. Federation-looking ship on collision course. Riker and Data suggest plans, Picard goes with Data's. Collision, ship spinning out of control. Data programmes something into the emitter just before the ship explodes! The Enterprise is going into a previously unexplored part of space. The same card game is happening, Worf and Beverley have deja vu. She thinks she can name the cards, but Data deals all 3s, then deals 3 of a kind to everyone. Beverly is called to sickbay to see Geordi. 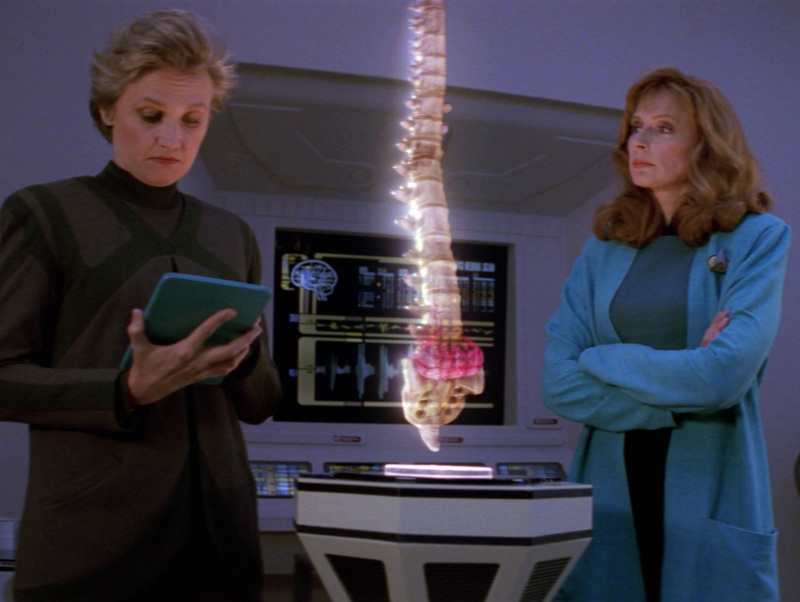 She pauses during her diagnosis because its so familiar, and Geordi feels like its familiar this time too. 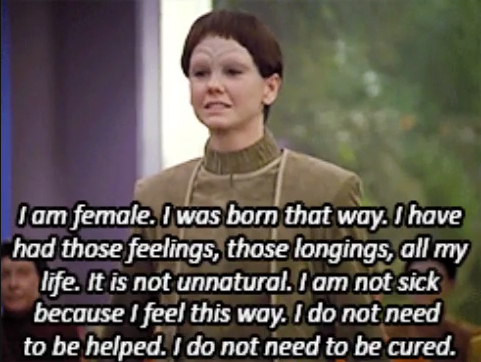 They check the logs but can't find that Geordi's had these symptoms before. Can 2 people have deja vu about the same thing? She finds the visor issue, and calls Picard to sickbay immediately to report. 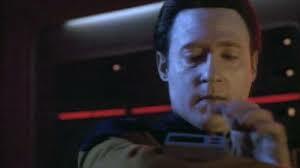 In Engineering every scan Geordi asks Data to run comes out as 3, Data says he's been encounter 3 a lot. Crusher calls them about the voices. In a meeting Data plays the recording of the collision. Geordi explains that they're probably stuck in a time loop, which appears to be sponsored by the number 3. The 3s seem to be coming from Data, and Geordi says they're probably sending a message to themselves. Ro calls from the Bridge to report weird readings. Weird field ahead. Engines aren't working. Riker wonders how they dealt with this before. Federation-looking ship on collision course. Riker and Data suggest plans, Picard goes with Data's. Then Data sees the 3 pips on Riker's collar, understands that he was telling himself that Riker's plan will work, and enacts that plan without orders. They pull clear of the distortion and avoid the other ship. Turns out they've been in the loop 17.4 days. The other ship is one that hasn't been in service for 80 years. 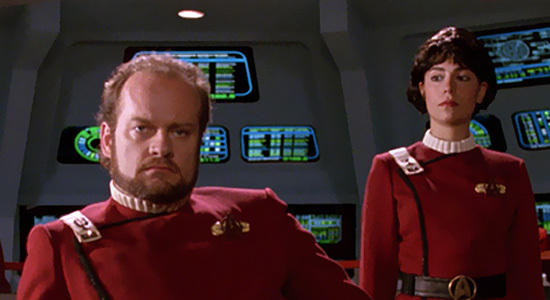 The captain of the other ship (Kelsey Grammar, finally!) hails and Picard tells him about the time loop. I saw Kelsey Grammar's name come up in the credits and I was exicted because he and Patrick Stewart work really well together. I mean X-Men: Last Stand was a mess that my husband (a long-time X-Men fan) pretends doesn't exist, but that wasn't the fault of either of these two fine actors, their scenes together were good. 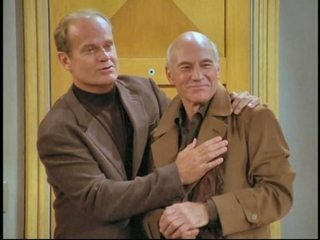 Plus, who can forget the episode of Fraiser where Sir Patrick plays a gay opera director with whom Fraiser unintentionally enters into a relationship. Basically I was looking forward to seeing these 2 on screen together, and what did we get? A minute or so tacked onto the end, a conversation via view screen, meaning they aren't even sharing a set and the fascinating potential of Grammar's character is never used. I feel a little cheated, which is a shame as the rest of the episode is well done. she's found out 10 other people had the same experience at the same time. Troi sensed nothing. Data is asked to check the logs. Worf calls Picard from the Bridge. 1. (a) Data and Geordi report that their scans couldn't find anything odd happening on the ship the previous night. 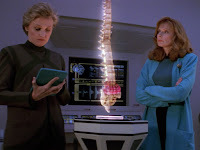 Dr Crusher mentions that she's found 10 other people had the same experience at the same time. Worf calls Picard from the Bridge. 1. (b) Crusher calls senior staff before the usual 0700 meeting. Geordi reports that they think they're stuck in a time loop, and that's what's causing the deja vu. Geo can't tell how long they were trapped there (minutes, hours, years). The voices and his visor issues are echoes. 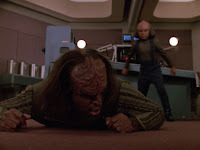 Data analysed Crusher's recording, it's mostly normal, but he plays the audio of Worf finding the distortion and Pic giving the abandon ship order. Geordi guesses that the collision caused the time problem, and they should avoid the collision, but anything they try might cause it. He points out that they might still collide this time and then forget again, so they should try to send information into the next loop. Data thinks it's possible as they've been experiencing echoes. Geordi says the message can only be short, maybe only one word or a few characters. If they do it Data will pick it up, but probably not consciously, it'll be like a post-hypntoic suggestion. 1. 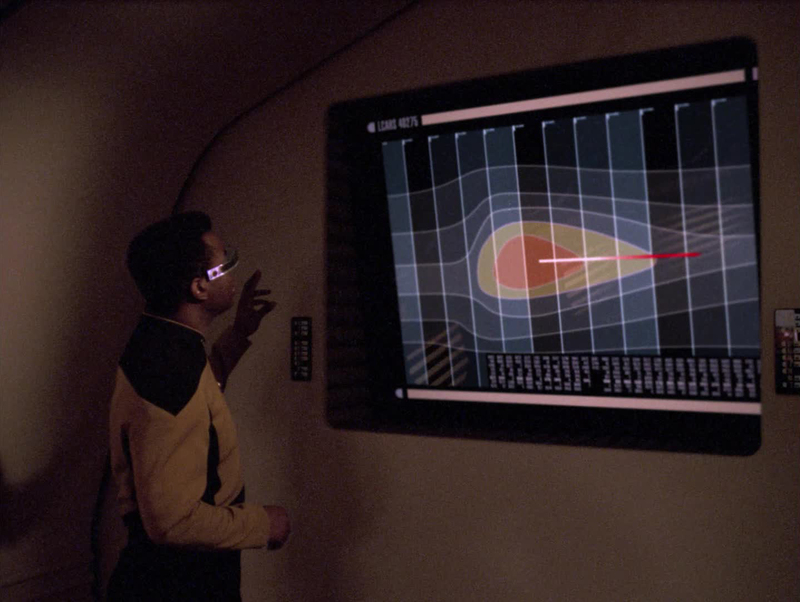 (c) Data is playing the isolated audio relating to the collision, and Geordi explains the time loop. Geordi guesses that the collision caused the time problem, and they should avoid the collision, but anything they try might cause it. He says the number 3 is appearing all the time. 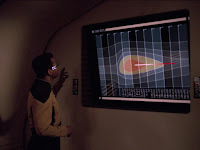 The only odd thing on scans is in Data, and Geordi reckons that he'd use Data to send a message to the next loop. They realise they're sending a message, but don't know what the 3 means. Ro calls Picard from the Bridge. After Picard mentions that both their ships have been caught in a time loop the other Captain is dubious as they only left star base 3 weeks earlier. Picard asks him what year it is and other Captain says 2278. Picard asks him to beam aboard as they have "something we need to discuss". And that's it! No telling someone they're nearly a century in the future. No dealing with the fallout of time travel or the time loop for the ot crew (who must be suffering heavily with deja vu by this point). No face to face scene with Grammar and Stewart being likeable at each other. I just wanted somethign like this! I've not posted much recently because I'm moving house soon so there's been a lot of preparation for that. Additionally mid-August is the busiest time of the year at my work. Basically I've not had much time or brain space for blogging. I expect that I won't be able to post regularly until next month, when hopefully I'll be well set up in my new place. A young woman aspires to decidate her life to poetry and become the new Court Poet. Ignoring family expectation she embarks on a quest to find the poetry-loving Spider Sisters, and makes a deal to have a Spider as her mentor. Throughout the mentorship the girl learns a lot and develops a special bond. It's vividly told story, and one with a lot of beautiful imagery, as makes sense for a story about poetry. It's a great story about working to achieve a goal and discovering on the way that your priorities have changed. Frank Mattie, formerly an underling/minion for villains applies for a sidekick job, even though people with his background aren't ecouraged. He is really intimidated, but eventually able to demonstrate that he has experience that would be of use, because of his seemingly-undesirable background. One of the creepiest stories I have heard/read in a while, a sister that can't say no and one who has no compunctions about controlling. There are powers in the story, but it's the dynamic between the sisters that's the main focus. I was so tense wondering where this would go, from the start it was clearly nowhere good. It's tragic, but I feel like the ending was earned. A young Bengali woman is on a date that doesn't interest her, when it turns out that her grandmother's warning about ghosts jumping down her throat is actually a real thing. Meena has the ghost of an old man in her, and he just wants to eat the food he's been missing since he died. Unable to get him easily exorcised he agress to leave if she'll save his banyan tree, which is due to be destroyed. She contacts a journalist of her acquaintence and starts a campaign to save the historic tree, and the ghost tries to help with her lovelife. This is a warm and funny story, which shows a bit about life in India, and has a protagonist who is very relatable. Mythological, woman-shaped beings roll into a small town, looking for any party where they can pick up men. They are a well-prepared hive mind, with outfits to fit a variety of situations. They sing their songs and lure men to a fatal crash, but on the way they also pick up a girl called Sarah who sees through their songs. This story is interesting, told from the perspective of the sirens their nature is never hidden, although theur methods are only gradually revealed. It's odd somehow to have a story where feminity, or at least various trapping of it, are used in a predatory way. 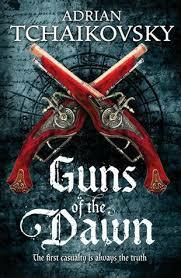 Tension is created and gradually increased from the start as things start to go awry and the millennia-old hunters face a situation they weren't expecting. This is a story with many antagonists, and no clear hero, but it is compelling. A woman testifies against her father, a notorious mass-mudering autocrat whose experiments were horrific. She has to relive memmories of her happy childhood and attentive father, whilw now acknowledging the horror of what was happening in the background of her childhood. The story explores what happens to innocents who are close to monstrous people, and how a child has to deal with the ugly trith of a parent. A distress signal on a moon seems to come from a centuries-missing Federation ship. Picard intends to leave, but Troi senses a life down there. The electromagnetic conditions on the moon are too dangerous for transporting, so Riker, Troi and Data go down in a shuttle to investigate. The shuttle crashes, Riker breaks his arm and Troi senses life in the oncoming storm. O'Brien volunteers to beam down with some transporter-boosting gizmo so they can all beam back. After O'Brien beams down and sets up the equipment, lightning strikes and they all fall down. Glowy balls go into everyone except Riker, who wakes and activates the transporter. The hostage-takers have computer access behind the bar, so O'Brien stops the transporter room from locking onto them. He also makes sure the sensors don't work in there. The Bridge crew try to resolve the situation; flooding the room with knock-out gas won't work on Data (also, there's a baby in there). Riker suggests blowing the doors open and phaser stunning everyone (guys, There's A Baby In There!). 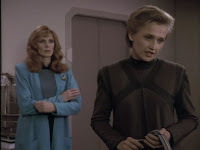 Picard asks Crusher to check the recent scans of the possessed crew members, see if she can figure out what's happened. Then the Captain negotiates with the hostage-takers. 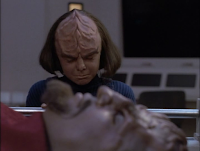 The thing inside Data is a massive jerk and tries to pick a fight with Worf, which would be interesting to watch. 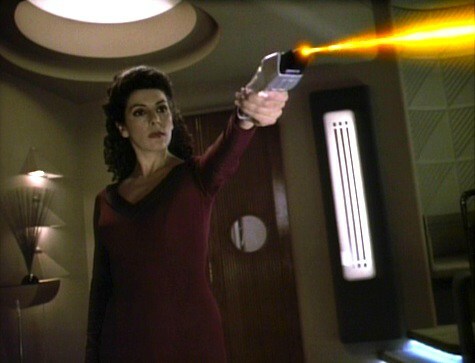 Troi stops his nonsense, she's clearly in charge. The thing inside O'Brien recognises Keiko and becomes fixated on her. Troi threatens to injure more hostages unless they go to the polar region, Picard agrees but the ship goes slowly. Crusher figures out that a weird reading from the three was probably something taking control of their brains. Riker wasn't affected because of the pain of his broken arm, so causing pain should force the beings out. Geordi and Ro suggest zapping them with a burst of energy that will cause pain but not damage and should flood Data's neural network too. Picard tells Crusher to figure out a way of containing the entities once they're out. Geordi and Ro go to drill a tiny hole through the ceiling of 10 Forward and get the zapper ready for when the hostage takers are standing together underneath. 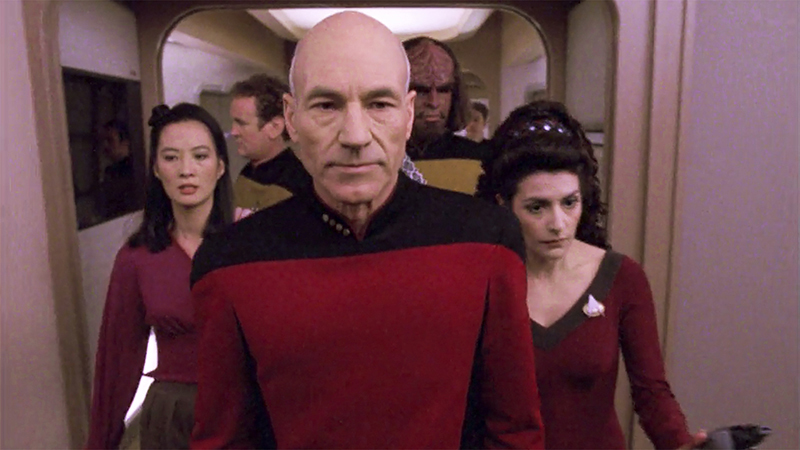 Picard goes to swap places with the injured hostages in 10 Forward. 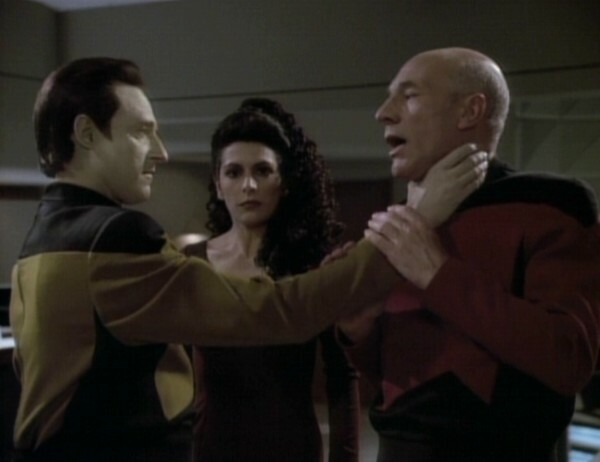 "Data" is suspicious of him, but "Troi" allows it. A medical team takes the injured away, but leave Keiko and her baby! "Troi" reveals that they're ghosts from the missing ship, she's the captain and the other two are her officers. They knew Picard didn't believe in ghosts, so they had to use deception to get what they want, which she claims is rest from their torment. Crusher figures out how to contain the entities, so now Geordi and Ro just need to prep their zapping device and wait for the opportunity to use it. Picard talks to Worf, he doesn't believe these are ghosts because Star Fleet officers wouldn't act this way. 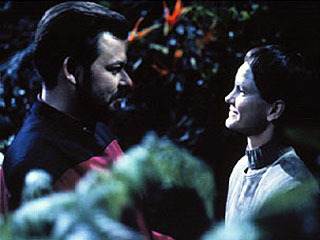 "O'Brien" tries to kiss poor Keiko. The ship is at the polar region, and Troi instructs Picard to beam up their remains to be taken home for burial. Picard asks her to release everyone, she refuses and Picard points out that if she is who she claims there's no need for this. "Data" threatens to kill Worf, and "O'Brien" allows Keiko to pass Molly to some nearby before bringing her forward to be killed. The hostage-takers stand together under Ro and Geordi so they activate the zapper, but "Data" moves at the last moment, so only two are zapped. The two glowy balls are forced out, but "Data" has Picard by the throat and threatens to kills everyone in the room, so Picard orders them to abort the rescue attempt. The Bridge crew try to find whatever "Troi" wants from the pole, but the storm stops both sensors and transporters from working. 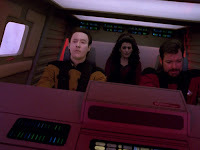 Picard and Riker manage to convince "Troi" that nothing will work due to the electromagnetic weather, Picard offers to take O'Brien to a cargo bay transporter, as he was the only one who could get it working before. "Troi" says they'll all go and take one hostage each and Picard must ensure they have safe passage. "Troi" takes Picard, "Data" takes Worf, and "O'Brien" takes Keiko, while Molly is left with that lady again. Picard orders that they have safe passage to cargo bay 4 and all transporter control is given to "O'Brien". Riker figures out that Picard chose that cargo bay for a reason, and orders Ro to blow the external doors if needed. In the cargo bay Picard asks how they plan to find rest. 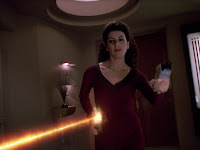 "O'Brien" beams in a column of energy. "Troi" says they don't want rest, just escape, and reveals that they're prisoners, separated from their bodies and left 500 years ago. 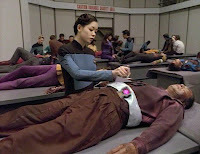 The energy column is 100s of their fellow prisoners, and now they plan to escape using the bodies of the Enterprise crew. They almost escaped on the previous Federation ship, but it wasn't strong enough to escape the storms. Riker orders Crusher to flood the cargo bay with her containment field, the prisoners are all trapped. Picard points out that they'll all die when the doors are opened, and each hostage points out they're willing to die. 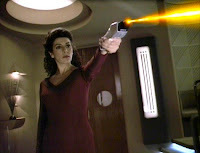 "Troi" concedes that they're stuck, and Picard offers to send them to the moon's surface again if they release his crew. The three balls of energy go and join their mates. This is one of the episodes where Picard really earns his reputation for being a great captain, who leads well and cares for those under his command. When Riker objects to Picard swapping himself for hostages in 10 Forward Picard says that he's a hostage no matter where he is. He's rational about his duties to crew and ship, he feels strong emotions about the situation, but doesn't let them come to the fore, remaining calm in order to be most effective. He's willing to negotiate, and put himself in danger and even to die for his crew. 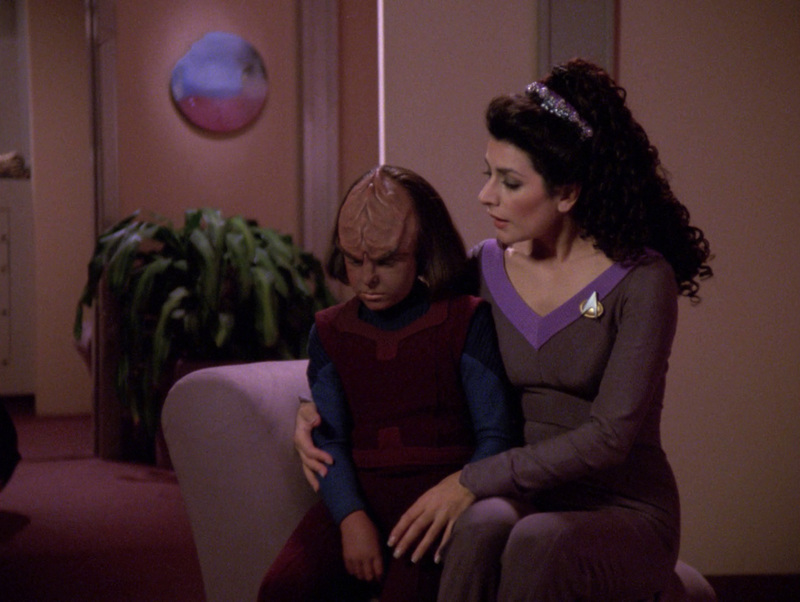 "Troi" knows he'll try to prevent violence, and that's the easiest way to manipulate him. As long as there's a threat to the ship. Data needs a firewall. Seriously, the hostage-takers could not have gotten as far as they did if one of them wasn't possessing an android. At least we know it wasn't Data himself doing it, because as we've already seen, Data has the ability to commandeer the entire Enterprise and potentially kill everyone else on board all by himself. This isn't the infamous 'Good Troi episode' (is that soon?) but this isn't far off as Marina Siris plays the part of a calculating, non-nonsense leader really well. 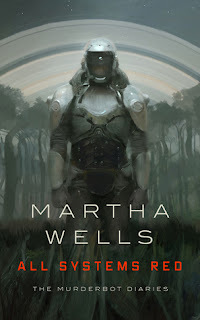 It's plausible that she could be a Captain, and it's only the cold, ruthlessness that gives away the fact that the possessing entity isn't who they claim to be. Her annoyance at "Data" revealing them is plain, she was going to use Troi's position of trust with Picard to go to the polar region, and probably could have got things done a lot quicker and easier that way. In fact it seems as though the two other glowy things are in the category of incompetent henchmen, letting their character flaws get in the way of the plan. Perhaps the one who was going to possess Riker was smarter? Their marriage is a series of unfortunate events (see also, any O'Brien family episode of DS9). In this case a creature wearing her husband like suit fixates on Keiko and sexually harasses her, while she's held hostage with her baby. It's clear that it has access to Miles's memories, which is why it recognises Keiko and Molly. If it has access to Miles's emotions that is presumably why it tries to kiss her. That doesn't quite explain why it volunteers her to be killed, unless it's a way of removing her as a factor. 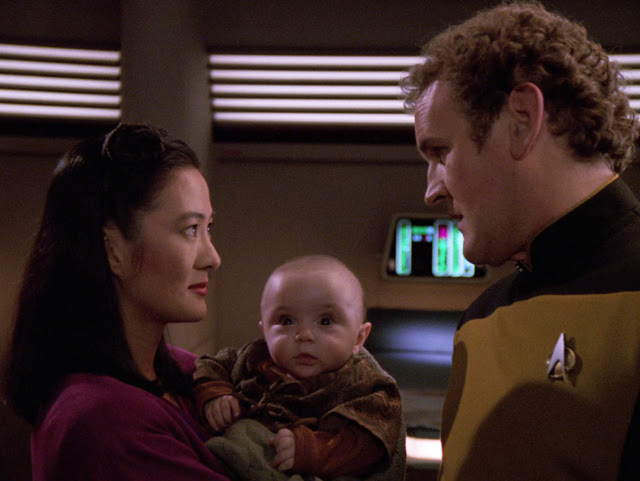 We get a real sense of the personalities inside Troi (a calculating leader) and Data (an aggressive jerk), but the one inside Miles is just, fixated on Miles's wife and not happy about it? Not quite a character trait. At the very end Miles is saying he would've killed the thing inside him if he could've and Keiko reassures him that she (and Molly) know. I think it's supposed to be heartwarming, but it really isn't. Yeah, there was this weird synaptic reading on three of the away team (including the one with a man-made brain) when they came back, but we didn't check it out. I like Crusher, but seriously how is stuff like this not something you quarantine people for and figure out before letting them back into the general population? 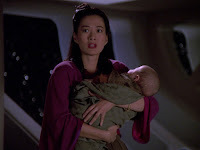 All those plans to get into 10 Forward, knock-out gas and phaser stuns, those might not damage an adult but I don't think a baby has that tolerance. Of course since the sensors were off they might not have known Molly was present, so I guess I can give that a pass. (There don't usually seem to be kids in 10 Forward, although now I'm wondering where the parents and families hang out.) No one mentioned that there was a in baby there when Worf or Picard could talk to the Bridge. Shouldn't Molly (and perhaps Keiko) have been evacuated with the injured people? It's like only Keiko, Miles and that lady who kept holding her could even see Molly. Of course they aren't actually ghosts, that would be deeply silly. It's gotta be disembodied, imprisoned aliens, far more rational. It's interesting that Worf says cases of possession have been reported throughout Klingon history and they even have a word for it. Picard doesn't dismiss Worf's belief and says humans have similar ideas, but points out that in this case it seems unlikely that these used to be Star Fleet officers. I mean these guys are disembodied, but still extant and capable of possessing others, so they seem functionally the same as ghosts. 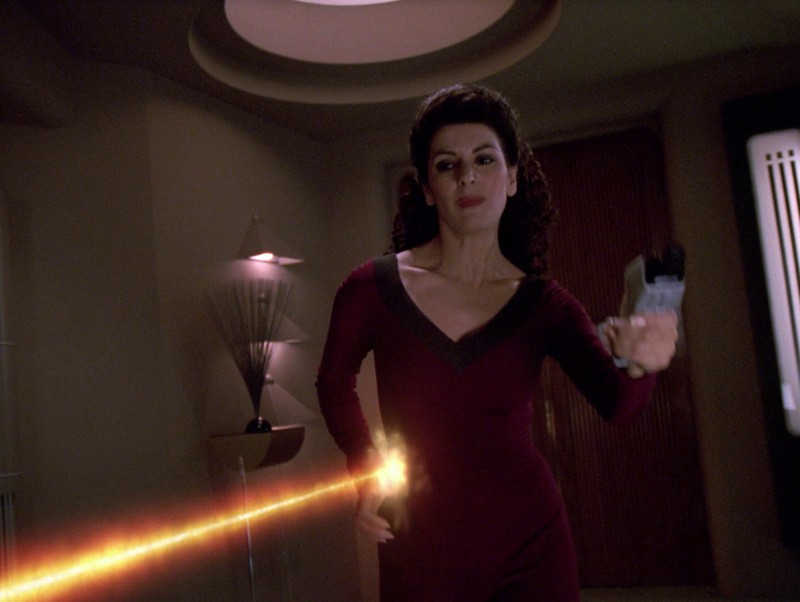 Troi describes what it was like, able to perceive everything but having no control. Data apologises to Worf. 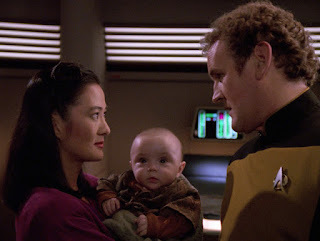 The O'Brien family leave sick bay together and Miles says he would have killed the thing inside him if he could, which I think is supposed to be sweet and reassuring. This is supposed to be a light sort of ending, but it feels artificial. Everyone should be processing what they've been through, but there's no time for that, so some mild banter will apparently suffice (also, aww baby). Not much actual reading for me recently. Well, I'm gradually working through Tim Peake's Ask an Astronaut, but that's non-fic and I'm mostly reading little bits at a time. The baby was having some sleep-regression/teething/eczema issues, so evenings and a few nights have been interrupted. Hopefully he's working through that now. Still listening to podcasts on my commute whenever I don't have the baby with me. About a woman who works in a vets late at night and helps patch up local werewolves. She encounters a fat werewolf nicknamed Thunderhead, mean and reckless even for a werewolf. The story shows us the nighttime work of the veterinarian and how she helps the werewolf population and keeps their existence unofficial. We learn about the narrator; her own history with werewolves, and her ritual of getting a tattoo to cover/comemorate scars. We see that daytime and humans aren't necessarily safer and that being a monster isn;t about whether you can change shape. 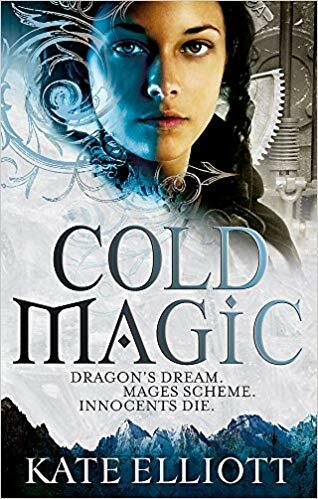 An intriguing story set in what intitially seems to be a magical shop, but is actually somewhere much stranger, where the proprietor runs a strange game of chance where the stakes can be seemingly anything. It is told from the point of view of a regular, but one who is in a desperate frame of mind, which lends a tense edge to all that trasnspires. It is a story full of mystery, including the cause of the narrator's desperation, the nature of what he wants and the identity of his tormentor. This was so sweet and lovely, as well as being really well done. It's about HK182 and Lawrence going about their days; she is contented as usual, he is hungover and vulnerable. Then there's the chance encounter and further meetings, and it works on an emotional and story level. The Dual narration works really well as the story focuses on each character's POV and captures their different mindsets very well. The contrast between human artist and android landscaper is strong, but the interest they have in each other and the growing areas of compatibility are built up really well. Definitely a story to cheer you up. An insectile being is confused by his human crewmate coming back to save him during a dangerous mission. When her rescue attempt leads to injury he ensures that she is cared for, and whilst talking to her as a distraction he diagnoses her with homesickness. The captain's cure is bizarre, but fellow humans will likely find it adorable. This story works really well because the clash of cultures and mindsets doesn't stop there from being much respect and affection between the characters. It's a great example of crewmates-as-community, a sci-fi trope I enjoy more and more. It's often cool to see humans from an 'alien' perspective, to have our foibles played back to us to expose how weird they are. The ending is pretty cute. Max struck me as a fun character, very clearly American/Western, and her attitude contrasted strongly with Krem, the main character who comes from a strongly communal society. The story made me think of Becky Chambers work, especially Long Way to a Small Angry Planet. This was difficult and powerful. It's super dark which isn't normally my scene, but it was so well done and somehow intriguing . The narrator does good work to make the horrible POV character somehow understandable despite being a sociopathic baby-killer. That took real skill and the narrator deserves praise for her amazing performance. The central SF concept is intriguing and the ramifications of how things could work out are fascinating, while also being kinda awful whichever way you look at it. There's a conundrum at the heart of the story, which keeps your intellect occupied even as your emotions are reeling. I think the dispassionate voice of the main character, who relates horrors in a matter-of-fact way, is what kept it from being too much for me. I felt really bad for the main character's daughter, poor girl was surrounded by such awfulness and barely spoken of with affection. It's interesting that the respectable, wealthy woman in the story came off almost as cold and hard as the murderer; the story could spark discussion of how someone's background influences their outcome. It's hard to blithely recommend this story, as it could easily be too much for people, there's reference to murders and sexual assault, and no sense of remorse. I'm surprised I managed to enjoy it, I must've been in the right frame of mind, or perhaps it helped that I was travelling while I heard it. If you do listen, maybe have one of the happier stories I mentioned further up ready to go as a pick-me-up. A story set in a future where Americans have fled their country and are being accepted by other nations, we see a girl in South Africa getting used to being allowed to run outside and meeting one of her future schoolmates. As the story unfolds we find out more about the narrative character, her family and their uneasy status as refugees. We also gradually find out more about the situation in the US. It sounds like a dystopia, but it's eerie in it's plausibility. Sadly there are loads of actual people who would applaud the awful measures we see in the character's reminisce. It's also a story about a boy and girl meeting. The host of this episode makes some good points about how difficult being a teenager can be, and how things are made worse for many people.